Michael Burtch, is a graduate of Queen's University in Kingston Ontario. an Adjunct Professor of Art History and Research Associate with the Nordik Institute at Algoma University . 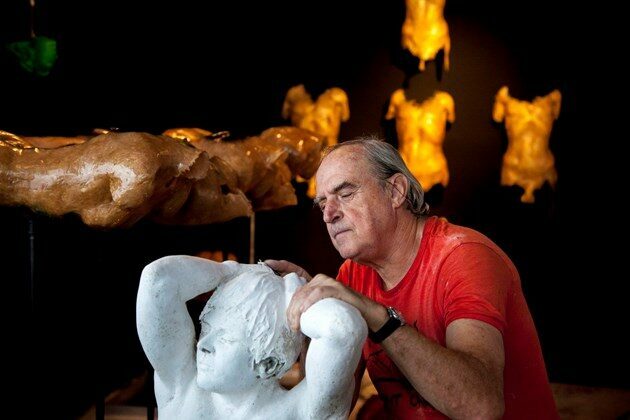 a sculptor and a sound artist with an extensive exhibition history. most recently he contributed his curatorial essay to the Art Gallery of Algoma's “One Hundred Years of Art in the Sault”. His book “Hymn to the Sun” about the early work of Jack Bush accompanied a national tour of the artist’s work. He was engaged in a major research project with Gary and Joanie McGuffin on the Group of Seven. The project entailed extensive research and field study with the goal of identifying, documenting and interpreting exact sites in Algoma and Superior’s north shore where members of this famous group of artists painted their iconic works. This extensive research resulted in a documentary film, commissioned by TVO and produced by White Pine Pictures, which was released in October 2015 for broadcast. During his teaching years Michael was named a "Hotshot prof" in the Globe and Mail of October 21, 2014. This article reviewed all Canadian Universities and in each of them a "Hotshot prof." was chosen and MIchael was chosen for Algoma University. In 2017 the film was nominated for a Canadian Screen Award, the Barbara Sears Award for Best Editorial Research. March 7, 2017 Michael and others WON the Canadian Screen Award, the Barbara Sears Award for Best Editorial Research. Click here to read all about it, view pictures of the award presentation and various media articles.